Azealia Banks is among the greatest modern poets of trash-talk. While others, like Cardi B who recently threatened to "dog walk" Tomi Lahren, can certainly hold their own, Banks' signature cocktail of bizarre aim, meticulous precision and full-throttle nastiness is truly singular. Everyone who's anyone has beefed with Azealia at some point, but much of her best work has emerged from her match-up with Grimes and Elon Musk. As we're beginning to see, her speciality is roasting white indie girls… remember when she incited Lana Del Rey to threaten physical violence? The latest flare-up of the Banks vs. Grimes/Elon Musk debacle (which is alive and well) has produced some indelible new contributions to the Banks canon. 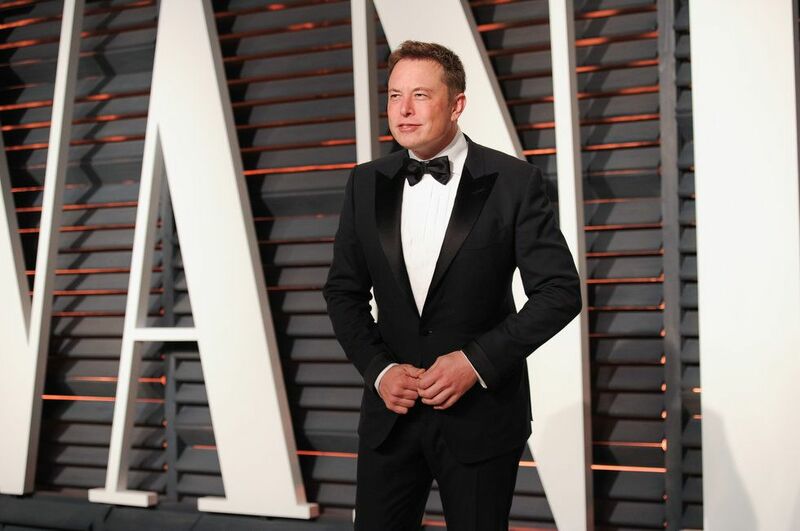 Although Azealia previously apologized to Musk and expressed wishes to end their "cat-fight," Musk's lawyer recently called her a "Twitter villain" and a "veteran of long and nonsensical beefs" in an attempt discredit her as a witness in the lawsuit that Musk faces from investors, after his false Tweet that he was taking Tesla private at $420 a share (allegedly, a joke to amuse his lady) cost the company millions. 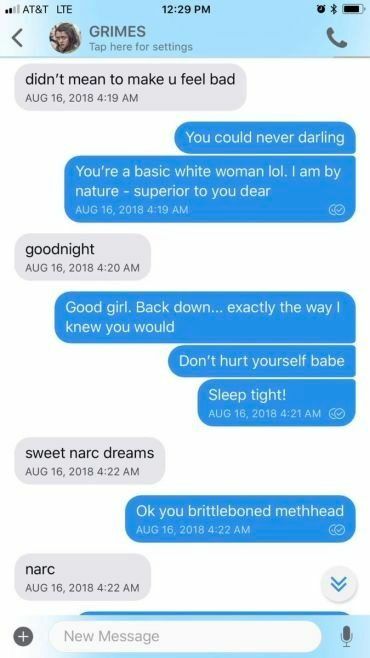 So naturally, Banks took back her apology by sharing a series of texts with Grimes from August, in which both women go full Mean Girls and take turns body-shaming each other. The entire 4:00AM exchange is wild. Azealia Banks devised an elaborate campaign about Grimes' generally frail and pallid appearance, while Grimes went with the classic, but unoriginal "you're fat." You can read the whole exchange at Consequence of Sound, but here are our five favorite moments below. 1. 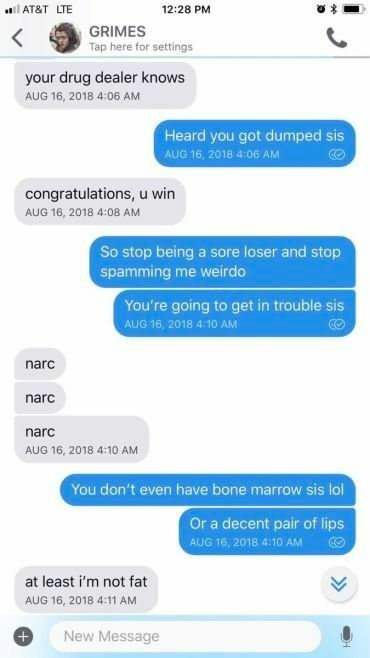 "You don't even have bone marrow sis"
Wow! Cutting deep. Might be going out on a limb here, but this attack feels two-pronged, suggesting that Grimes, sans bone marrow, is both weak and crush-able, and an artistically soulless android/lab-experiment. 2. "You smell like a roll of nickels"
What does that mean? Is it even a bad thing? Maybe nickels could smell fresh, like a new car or jewelry? Again, Azealia attacks from the Grimes from the sick-but-also-a-made-of-metal route, implying that Grimes' industrial odor reveals both her physical weakness and internal emptiness. 3. 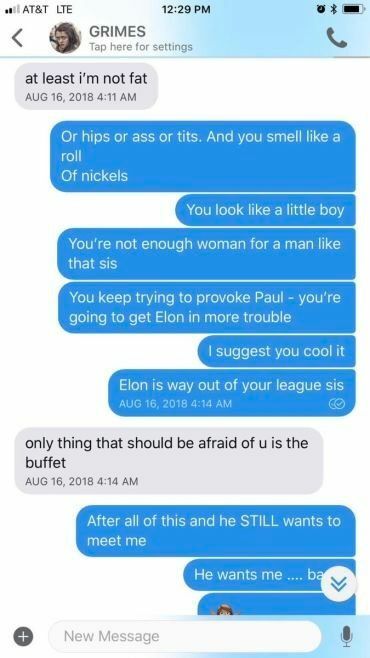 "Elon is way out of your league sis"
4. "Okay you brittle-boned methhead"
Still hammering on the orthopedic angle, here Azealia impressively widens the range of ailments she suggests describe Grimes' admittedly birdlike appearance. 5. "Only thing that should be afraid of u is the buffet"
Grimes got one fairly iconic jab in here (though Azealia was, of course, completely unphased) but she lost her momentum by, perhaps tortured by her white/and or skinny girl guilt, continuing to apologize to Azealia after every diss. "Sorry… shouldn't have said that," "didn't mean to make u feel bad" kind of throw the moment off. Good game, girls, absolutely terrible sportsmanship.